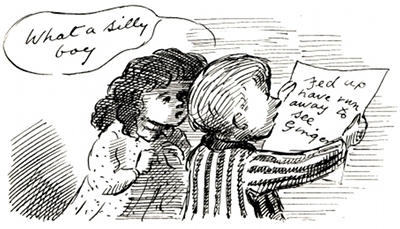 A drawing by Edward Ardizzone from his 1953 Tim in Danger. “It was a lovely day when Tim, Charlotte and Ginger were playing on the beach. The sky was blue, the sea was blue, and the white yachts were sailing in the bay. “But something was wrong with Ginger. He would mope. “Charlotte thought that he was remembering the time when he was a ship’s boy and was pining for a life at sea once more. She was right, for early the next morning, when Tim woke up, he found Ginger’s bed empty and a note from Ginger on it to say that he had run away” (p1-2). Fed up / have run away to see (p3).